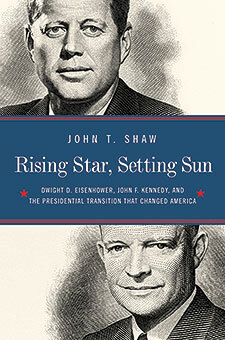 Rising Star, Setting Sun is a riveting new history that explores the complicated, poignant, and consequential transition of power from Dwight D. Eisenhower to John F. Kennedy. The exchange of leadership between the thirty-fourth and thirty-fifth presidents of the United States marked more than a succession of leaders. It symbolized—and triggered—a generational shift in American politics, policy, and culture. Site design © & maintenance by xuni.com. All content © 2013-2019, John T. Shaw.